SoWa Vintage Market always gets by with a little help from our friends. We like to return the favor. When my friend, Boston Fashion Show Producer + Fashion Stylist, Kathy Benharris, asked me to help her with a high profile show for BENRUS during Boston Fashion week, of course my only response could be: “when, where, what time?”. Kathy has been a fabulous friend to SoWa Vintage Market and she works magic with our finds at her styling hands. The job: show up at The Liberty and help the team dress Camille Kostek, former New England Patriot’s Cheerleader and BENRUS Brand Ambassador. And, oh, by the way, Camille is Rob Gronkowski’s girlfriend, so thre’s that. Trying to remain calm and be cool. “Trying” is the operative word. 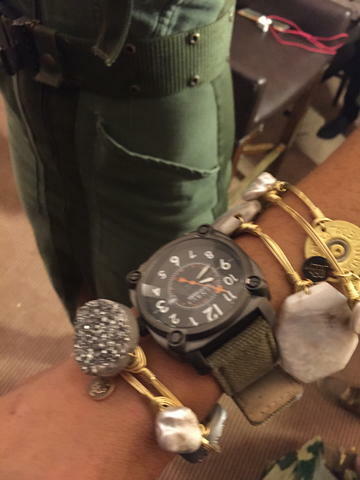 It was an exciting evening filled with fabulous military inspired fashion and timepieces. including Rob coming in to wish Camille good luck pre-show. He was wearing a sports coat + dark crew neck with jeans and asked if he looked okay. But Camille was the STAR of the show and looked fantastic in all of her looks including her finale in a custom made Benrus skirt designed from a silk parachute. And I loved the layering of watches with chunky stone bangle bracelets. Check out more pics here on the BENRUS blog for their coverage of the event and to see that amazing parachute fabric military princess skirt.